The Violet Flame is a very easy thing to access. It’s traditionally associated with Saint Germaine. Who is considered to be an ascended master. Which is a bit of an odd term when you think about it. And old term as well. It makes me think that they are above us, which is not the case at all. The violet flame is essentially a specific frequency of healing and transmuting energy. It is actually a flame that is purple. When it shows up for me that’s how it looks. Purple has a high frequency as a colour, so it is a fairly high frequency of energy. 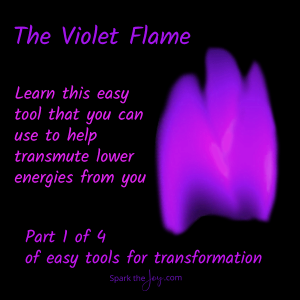 When I first learned to use the violet flame years ago I was taught to call on St Germain to come with it. You don’t need to do it this way if you don’t want to. I had just learned to call on angels for healing help so it made sense to me at that time. That’s not how I access it anymore. There is a traditional prayer like poem that people have used to call on it, but again you don’t need it. But if you want to use it, go ahead. The point is to find the way that works for you. When we call or ask it is always answered. Always. Sometimes we are not in a position to receive the answer though. But that doesn’t mean the answer isn’t there. We have tons of non-physical friends, is what I call them. My teams. Some people call them guides, angels etc. They want to help. They need us to call and ask though. We have the free will, so we need to give them permission. Anyone can do this, and you don’t need to believe anything specific. It doesn’t interfere with anything either. It is a fantastic tool for clearing away old lingering lower energies, straightening out entangled energies and bringing us back to our centers. I used it a ton when I was starting my healing journey over 8 years ago. Now I don’t use it as much, but it will still show up to be used in my client sessions. When you call on it to come, it always will, but sometimes we won’t notice a difference. That’s ok. Stuff changed. You can trust that it came and did it’s transmuting thing. Sometimes you will feel it. Tingly, warm, cool, emotional relief. It’s different for everyone, and as you use these kinds of tools more often, you become more sensitive to them and are able to feel the effects more. Ok lets connect and call on the Violet Flame. Ready? Close your eyes, roll your shoulders back and take at least 3 deep breaths. So that’s it. Don’t let you mind talk you out of it. YES it did happen. YES you did do it. I taught this on a Facebook live video in my Facebook group. I taught a few different ways to access it on the video. Here’s the video for you to watch. Join me in my group, there are 3 other tools of transformation that I taught there.